The Carolan Index (Doc's Workshop): website with all 214 Carolan Tunes (click) - arrangements, midi files, background, etc. The ***NEW (as of June 2014)*** Carolan Tune Book is now available (80+Tunes). Beautifully engraved by Nancy Taube- uniform formatting and easy to read! 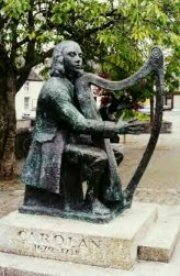 List of Carolan Tunes in the Festival Tune Book (***unless otherwise noted): Italicized tunes have been played at our previous Festivals The O'Sullivan # in ( ) is listed after each title. Brown, Margaret Maggie's Favorite Jig (180) Tunes without titles- "Planxty Brown"
Planxty #12 **Newly discovered in County Leitrim, The Grier Cllection** later variation is "Over the Moor to Maggie"